Hotel in Lozenets Sunset beach. Lozenets hotel. All Inclusive. Holidays in Lozenets. Hotel Black Sea. Booking a hotel. Overnight in Lozenets. 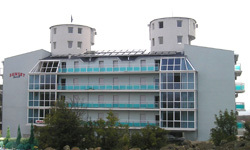 Hotel on the sea. Sunset Beach Hotel is located in the village of Lozenets, 65 km south from the town of Burgas, in the close proximity of the resorts of Kiten and Primorsko. Lozenets is a part of the unique “Strandjata” Eco-park at the foot of Strandja Mountain. “Perlata” reserve of nature under the UNESCO protection is located nearby, too.